There are many museums in Merida Mexico that are worth seeing. The city has done a wonderful job of curating these museums and other cultural events throughout Merida. Whether you are escaping the heat, the rain, or simply looking for something to do, these museums in Merida offer a great educational escape. We’ve created a list of the 7 best museums in Merida Mexico. They are a great way to learn about the history of the Yucatan Peninsula. For more things to do in Merida, read our guide for tips for traveling to Merida. This museum displays folk art from all over Mexico. One of my favorite types of folk art are the alebrijes from Oaxaca. This museum has some of the largest alebrijes we have seen. The collection also includes examples of the intricate Mexican tree of life, jewelry, and textiles. 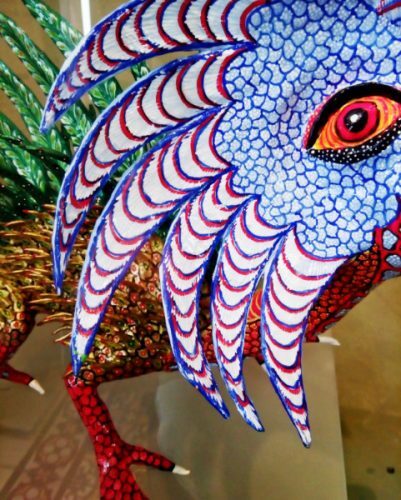 This large Oaxacan alebrije is on display at the Folk Art Museum. This museum of contemporary Mexican artists also includes a permanent exhibition of the works of Fernando Garcia Ponce. Located in a colonial building across from Plaza Grande, this museum is also a great escape from the heat when you are exploring Merida. Also located across from Plaza Grande, this museum is a restored home built in the 16th century by Don Francisco de Montejo – the conqueror of the Yucatan Peninsula. The four rooms on permanent display showcase the furnishings of the 19th and 20th centuries in Mexico. Built in 1892, the Governor’s Palace is home to the Yucatan’s executive government offices and a small tourist office. But the real attraction, located on the second floor, is the murals and oil paintings by local artist Fernando Castro Pacheco. These large pieces of artwork depict the history of the Mayans and their interaction with the Spanish conquistadors. We visited after watching the Mayan Ball Court Game and the night atmosphere made the paintings even more vibrant and dramatic. Hours: Mon-Fri 9 am-early evening Admission: Free Location: Calle 61 between Calle 60 and 62 Time: Allow 30 minutes. 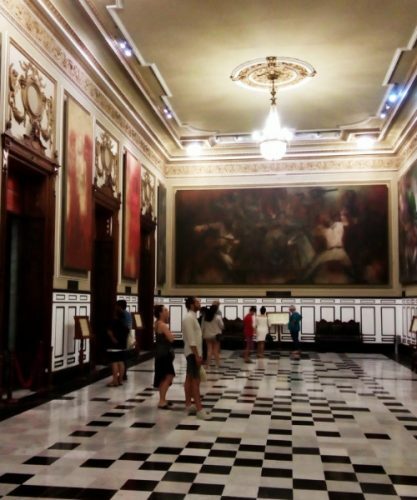 The Governor’s Palace where you can see oil paintings by local artist Fernando Castro Pacheco. Located near Mercado Lucas de Galvez, the permanent exhibits of this Merida museum feature archeological pieces that tell the history of Merida from Mayan times to present day. Located in a refurbished mansion, this museum is an extensive exhibit of local Mayan history. They also host a rotating exhibit a couple of times per year. This museum displays objects of Yucatecan music. There is also a small collection of pre-Hispanic and Afro-Cuban instruments. Many of the descriptions are in Spanish. Did you like this guide to the best Museums in Merida? Pin It! What a great blog post! We didn’t have enough time to see all of these museums in Merida, but we did manage to get to the folk art museum! Thank you! I pulled my friend along the Folk Art Musuem and he enjoyed it more than he thought he would. Another museum highlight is the Modern Art Museum – don’t miss it on your next trip to Merida!